Have you seen the latest Specsaver ad to commemorate the company's 25th anniversary? Their ads used to be good. This one featuring a lost sperm one is just plain silly. Anyway, seeing it (geddit?!) gave me the idea for a small group of pictures on the theme of eyes and opticians. 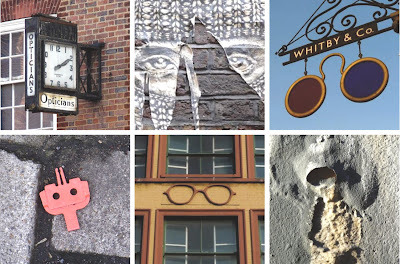 Shown clockwise from top left: clock, New Kings Road; ripped poster, Covent Garden; opticians sign, Fleet Street; skull face in the peeling paint, Mount Pleasant; spectacles motif, Lower Marsh; plastic doobrey, Holloway Road – lots more found faces here. Indeed Specsavers have been more inspired in the past. The lovely set of pictures largely compensates for it. One for for next set of glasses: the sign with the pig in a suit holding a top hat and a stick from the opticians located in Stoney Street (if I'm right. In any case near the junction of Southwark Street and Borough High Street). Thanks Sebastien, and I know the pig you mean!